The newest tablet from Google and Samsung’s joint efforts, Nexus 10, is a powerful device that marries Samsung’s best-in-class hardware, the latest version of Android—4.2 Jelly Bean, and the best of Google. With the world’s highest resolution tablet display, all new multi-user support, immersive HD content and the best Google apps – Nexus 10 has something for everyone. Nexus 10 packs powerful components inside a surprisingly lean, soft-to-the-touch frame – measuring an incredibly thin 8.9 mm and weighing just 603 grams, it’s the perfect couch or coffee table companion. Nexus 10 was created in partnership with Samsung and comes with a blazing fast dual-core A15 processor and advanced MIMO WiFi, giving you web browsing speeds up to 4x faster than normal WiFi. With the 1.9MP front-facing camera, you’ll look great as you video chat with up to nine friends at once with Google+ Hangouts, and so will your friends on the dazzling 10″ display. 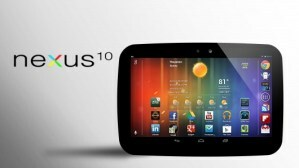 Nexus 10 was made for everyone to enjoy. Just turn on your tablet and tap your photo to sign in to your own home screen, apps, email, photos and storage. All new multi-user support lets each user have their own separate space, and save their own individual high scores on games, all on the same tablet. With the new Daydream mode on Nexus 10 you can display useful or delightful information on your tablet when it’s charging. Choose to show off your photo albums, get the latest news from Google Currents, and more.